Ssam literally means a wrap and Jang means a sauce. If you ever wondered why the names of many Korean sauces end with 'Jang' (e.g.Gochuhang or Ganjang), you know it now. It means a sauce. Ssam and Jang, together makes a dipping sauce for grilled meat which is often served in a lettuce wrap. Click on How to eat Samgyupsal to see what I mean. oh this sounds so good! I´m going to make it at home. Good luck! Homemade ssamjang beats all! 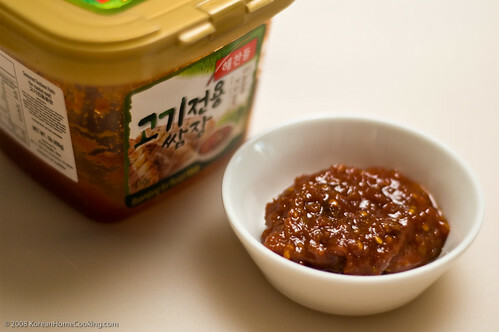 my korean dramas make me SO hungry for this stuff. thanks much for the recipe! I find when you add rice vinegar to it - it's even better. Especially on this dish.